On An Overgrown Path: Young Mahler - encouragement worthwhile? Young Mahler - encouragement worthwhile? 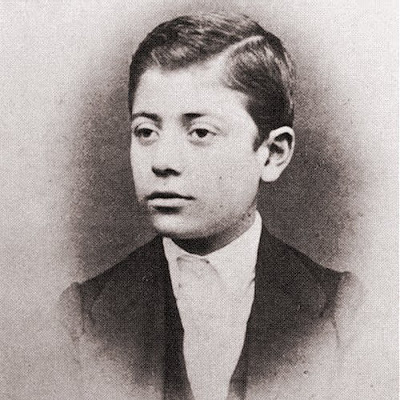 A charming and previously unpublished reminiscence of an 11-year-old Gustav Mahler (photo above) comes to An Overgrown Path from Elissa Minet Fuchs former ballerina with the Ballet Russe and the Metropolitan Opera. Mrs. Fuchs (see photo below) is the widow of conductor and composer Peter Paul Fuchs who was the subject of two tributes here when he died last year. A reader drew Mrs. Fuchs' attention to my articles and she has very kindly supplied me with material, including previously unpublished photographs, on her husband for a full appreciation to be published here on the first anniversary of his death next week. Among the material was this memory of a young Gustav Mahler. Peter's grandfather on his mother's side, Alois Rusicka, was born in a small town in Czechoslovakia not far from the Austrian border. He was a law student - pursuing his degree and an amateur musician, a cellist. On one of his visits home, he was approached by a tavern keeper. He was asked to meet the tavern owner's young son, 11 years, and to judge the boy's musical talent to see if encouragement in this field would be worthwhile. Herr Rusicka was absolutely sure that this was a significant talent - the boy's name was Gustav Mahler. 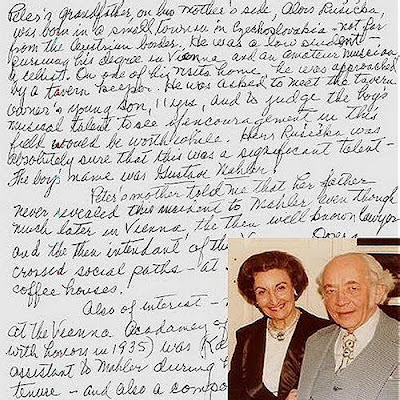 Peter's mother told me that her father never revealed this incident to Mahler even though much later in Vienna the then well known lawyer and the then intendant of the Vienna Opera crossed social paths - at soirées, the Opera, coffee houses. Also of interest - Peter's theory teacher at the Vienna Academy of Music (graduated with honors in 1935) was Karl Weigl, an assistant to Mahler during his Vienna Opera tenure - and also a composer. Below is the text of this story and a photo of Elissa Minet and Peter Paul Fuchs. I would like to thank Mrs. Fuchs in Greensboro, NC and Adrian McDonnell in Paris for making this valuable material available. There is also a private recordings of Peter Paul Fuchs music available exclusively as An Overgrown Path podcast.